Restoring the tooth structure destructed by caries or due to any other reason like trauma or wear and tear can be exquisitely done. With such an accuracy that it is virtually impossible to differentiate between the natural and restored part of the tooth. 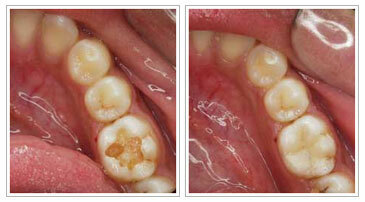 Dental caries is a progressive disease and should be treated as early as possible. The failure to do so will lead to spread of infection to the dental pulp and thereafter spread to the bone. The treatment of initial stage of caries is much simpler than the root canal treatment , that is opted for treatment of carried tooth involving the dental pulp. Thus, a step in time saves tooth health and wealth. Moreover, aesthetics is also a prime reason for tooth restorations. What Are The Steps In Restoring A Tooth? Restoring the tooth with most suitable restorative material in you case. But today, you can get your cavities, as well as any other smaller hollow areas in your teeth, filled with composite fillings. We use state of art technology and materials to restore your tooth. The restoration mimics your tooth in fashion that it is impossible to find out the restoration in your mouth. The latest generation composite filling materials are used, so that we leave no scope for failure. Using the latest in Ceramic and Composite materials by the trained professionals at Stoma Adavanced Dental Care, you can challenge your friends to find out the filling, and our bet is that they would always loose the bet to you and marvel at the finesse of our treatment. So as soon as you spot decay on your tooth… immediately get in touch with us it’s time to get your tooth filled. Professional examinations at regular four to six-month recall appointments are necessary. Developing problems can be found at an early stage and repaired easily, while waiting for a longer time may require redoing entire restorations. We will contact you when it is time for your recall appointment.